Abraham Lincoln, our 16th president, understood the connection between perseverance and success. He is credited with saying, “the best way to predict the future is to create it.” I predict a bright future for our students because Idaho is creating an education system that prepares our kids to thrive in the 21st century economy. We know that ensuring all students have great teachers makes all the difference. Teacher retention and recruitment continues to be a top priority. Idaho’s Career Ladder has improved educator pay and is helping schools attract and keep great teachers and leaders. In addition to our continued commitment to the Career Ladder, I have asked the Legislature to help address the critical teacher shortage in rural school districts by funding my teacher pipeline initiative that includes a “grow your own” program, a rural teacher fellowship and a recruitment and retention bonus. Targeted investments are supporting our schools and students to achieve. For the first time, Idaho’s high school graduation rate topped 80 percent. This reflects the hard work of Idaho educators and the state’s focus on ensuring that students are college and career ready when they graduate from high school. Our education system is increasingly focused on personalized education that is flexible and adaptable to individual student needs. We are continuing our transition to a mastery-based system that means student progress is based on mastery of skills and content, not on seat time, age or grade level. Providing more options for students helps them prepare for college or the workforce. Last year more than 32,000 Idaho high school students earned nearly 185,000 college credits. The state’s Advanced Opportunities program gives every Idaho student more than $4,000 to earn college credits or gain workforce credentials. The program is even helping students earn an associate’s degree by the time they graduate from high school. Idaho’s schools take care of the needs of more than 307,000 students every day. We have teachers, counselors, coaches, paraprofessionals, office staff, administrators, school board members and State Department of Education staff working to support Idaho students. This goes beyond educating. Our jobs include ensuring that students are safe – from bullying, substance abuse, suicide and violence. Student safety has taken on more focus and urgency with recent events across the country. I have proposed a comprehensive safety program, Keep Idaho Students Safe, or KISS. This initiative will train teachers to address students’ social/emotional needs through trauma-informed teaching. As so many states and local communities have learned too late, student safety cannot be taken for granted anywhere. I, my staff, and school districts and educators across this state are committed to the success and well-being of your children. 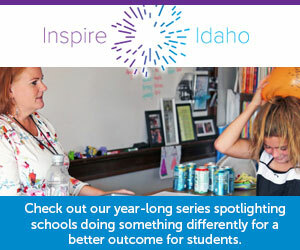 There are amazing opportunities on the horizon for Idaho students. I am looking forward to working with Gov. Little, the Legislature and our local school districts as we continue to create a bright future for all Idaho students. Written by Idaho’s Superintendent of Public Instruction Sherri Ybarra.